I had the unique pleasure of working with two (yes, two!) other bloggers as part of the Guest Post Swap for the 2012 Blogathon. (Check out my first swap post about Guelph, Ontario and its lovely rivers, too!) Elyse Grau writes at Garden to Table about everything delicious growing and going on around her in Oregon as well as her own garden. If you're like me, you'll be hungry by the end! Farmers' markets are everywhere these days. The USDA reported a 17% increase in the number of markets between 2010 and 2011. I've seen at least 3 new markets open within twenty miles of ours in the past year. I manage the market in the small town where I live. Creswell, Oregon is a town of 5000, with a large outlying rural area. 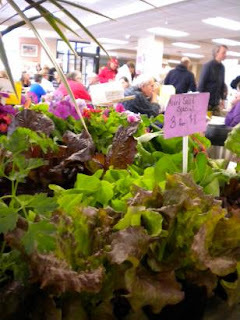 The market, currently in its fifth year, is held every Tuesday from 4-6 pm. It was originally a project of our local library, and was held in the library's “backyard” (a fenced-in partially covered ex-lumberyard). At the end of our 2010 season we moved to the parking lot and banquet room of a local caterer and baker. She had been one of our most popular vendors, and moving to her facility made life easier for her, and allowed us to remain open year-round. Being open in winter, in an area where very few crops will grow without cover has been a challenge. So far, we are meeting that by allowing some resale of produce bought wholesale. Many of the farmers installed greenhouses or hoophouses last year in order to begin producing vegetables year-round, and I'm expecting to see more vendor-grown produce this fall/winter season. Our biggest challenge though, is getting enough traffic for the vendors – winter or summer. Though our attendance soars in May through August, we'd still like to see it grow. Some vendors have higher expectations, and won't join, or will try is out and leave after a few markets. Others are more realistic and understand that it will take time to build clientele, and that only by showing up week to week can we offer enough to continue to attract more customers. Part of the reason for the low attendance is the economy. The down-turn started in the market's second year, and even as it improves, habits have been changed. We cannot always compete on price with some of the discount merchants in the area. Most of our customers are those who feel it is more important to support local agriculture and business, or to eat fresh, in-season produce than it is to save a few dollars. We're looking for ways to educate the rest of the consumers in the reasons for eating local and the benefits of eating seasonally. Many customers, used to buying any fruit or vegetable imaginable any time of the year don't realize that corn is grown in the summer and apples in the fall. We're working on that, too. We have a very friendly market, with few rules. Some of the larger markets impose many restrictions and fees on the vendors, and deal with much more conflict than I have ever had to face. In fact, all the regular vendors say that they come to this market mostly because they like it, not because their sales are so good! I enjoy managing the market (for no pay even!) for the same reason. We do have a good mix of items at the market, though I am trying to find more new items. Most of the farmers sell a majority of the same vegetables, but everyone will have one or two items unique to them, or offer a wider selection of that item, such as peppers or tomatoes. We also have meat and poultry sellers, beans and grains, nuts and honey. In the spring we may have plants (not this year) and some cut flowers in the summer. This year we started a program of brief talks and demonstrations. They are on all sorts of subjects dealing with gardening and cooking, and have included demonstrations of methods of cooking vegetables, a discussion and tasting of gourmet salt, soil testing and how to build a wood-fired oven. (the latter was our most well-attended talk so far). Elyse grows fruit, nuts, vegetables and herbs on a portion of her five acres in Oregon. She writes articles on gardening and cooking. She also authors a monthly newspaper column entitled “Garden to Table” and companion blog, both about growing what you eat and eating what you grow. As a certified Master Food Preserver she also teaches people safe methods of preserving what they grow.